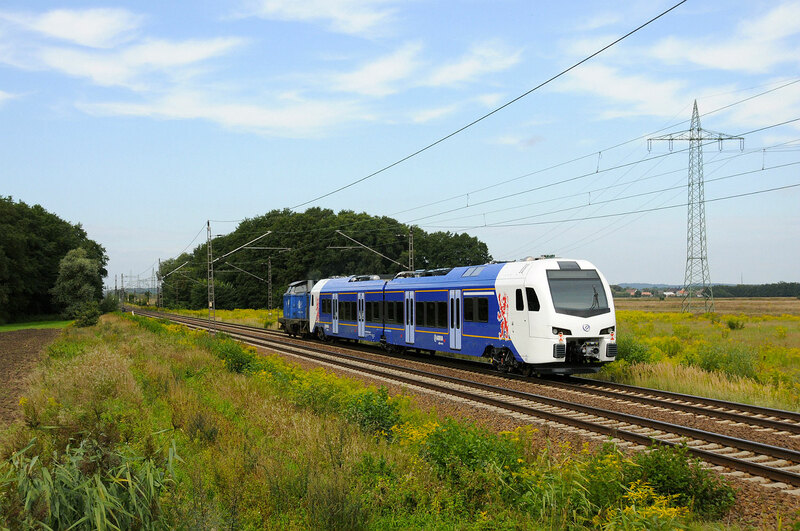 Stadler Rail in Siedlce, Poland, is working hard and working fast. It has a strong focus at this moment on completing FLIRT3 orders for Dutch operators. 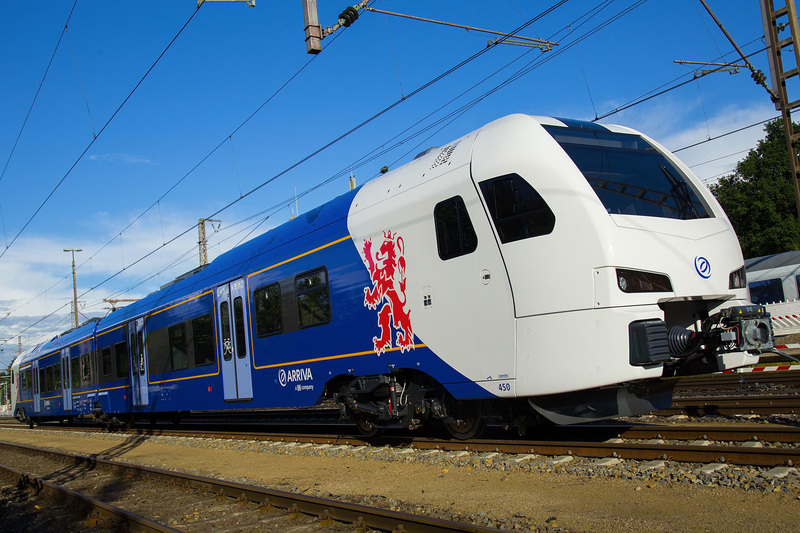 At this moment, the delivery of 59 FLIRT3-trains to the Dutch railways (NS) gains momentum, new trains are being transferred from Poland to the Netherlands almost every week. On 15.07.2016 however, one of NS’s biggest competitors, Arriva also took delivery of a FLIRT3 train made in Siedlce. On 02.07.2016, late in the evening, Arriva no. 450 arrived at Amersfoort freight station, after a long trip through Germany. An EGP V100 locomotive took it to the German/Dutch border at Bad Bentheim. From there a Strukton locomotive pulled it to Amersfoort. The Arriva FLIRT3 is painted blue, with white front cabs, like the GTW trains Arriva is operating in the Netherlands. 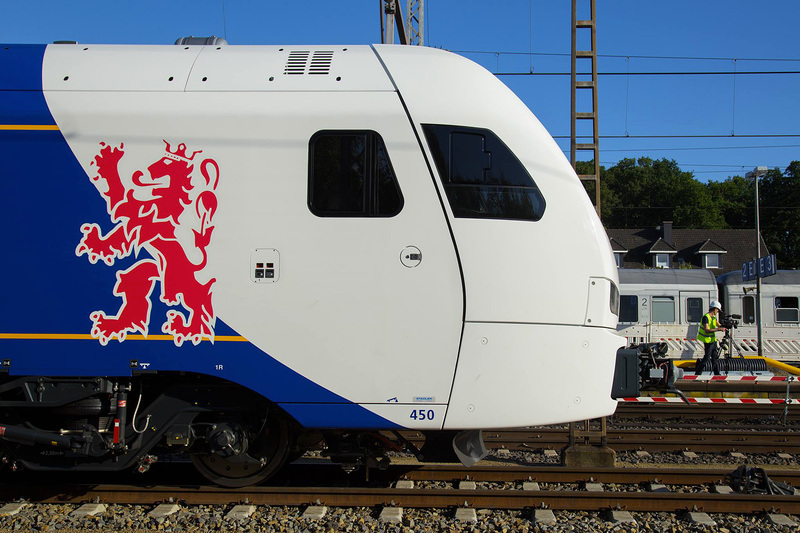 The FLIRT3 livery is enhanced with a big red lion on each cabine, a symbol of its future service area, the southern Dutch province of Limburg. Arriva in the Netherlands is a subsidiary of the German railways, or Deutsch Bahn. 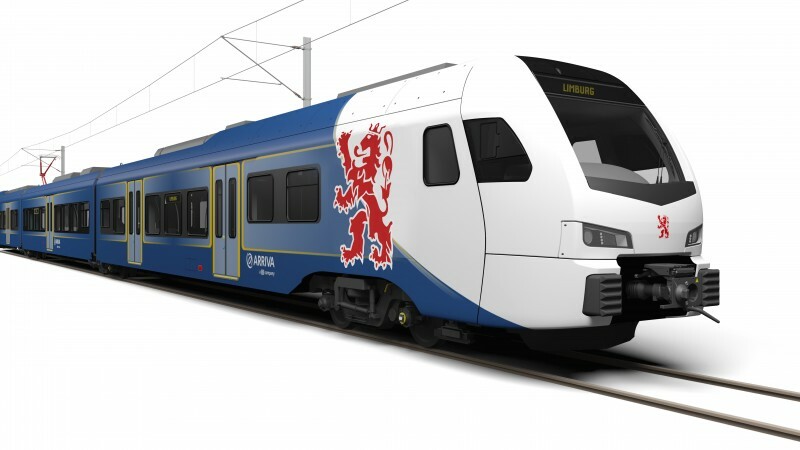 The operator will commence its first train services in Limburg as of December 2016. At that moment 15 FLIRT3 trains should be available to service. The concession covers all public transport in the province, including bus transport, for a 15 year period, being 2016-2031. The value of the contract lies around 2 billion euro. There will be an intermediate evaluation of the contract after 8 years. Included are the rail connections Kerkrade – Maastricht, Roermond – Maastricht en Sittard – Heerlen. Later on, international services Maastricht – Visé (BE) and Heerlen – Aachen (DE) will be added. 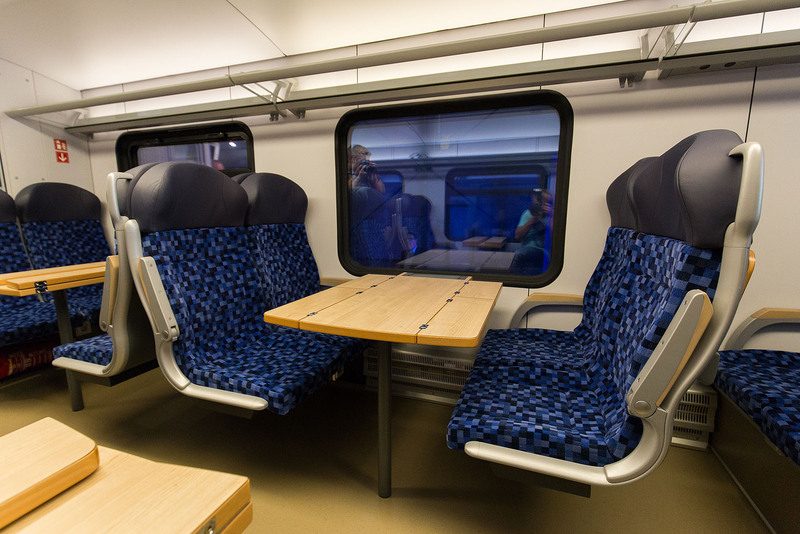 When electrification of the Maaslijn (Roermond – Nijmegen) is completed, which is planned for 2020, the Arriva FLIRT3 trains will be introduced on this line too. Next to FLIRT3, Arriva will also operate eight GTW trains. These will be taken over from Veolia. The tender process for the Limburg concession was one with many legal disputes. There were three main contestants: Arriva (DB), Abellio (NS) and Veolia from France. Veolia tried to get Abellio out of the competition as it would be too dominant already in the Netherlandse making a fair tender process impossible. During the process, Veolia was disqualified as its bid did not meet the concessions demands according to the government. 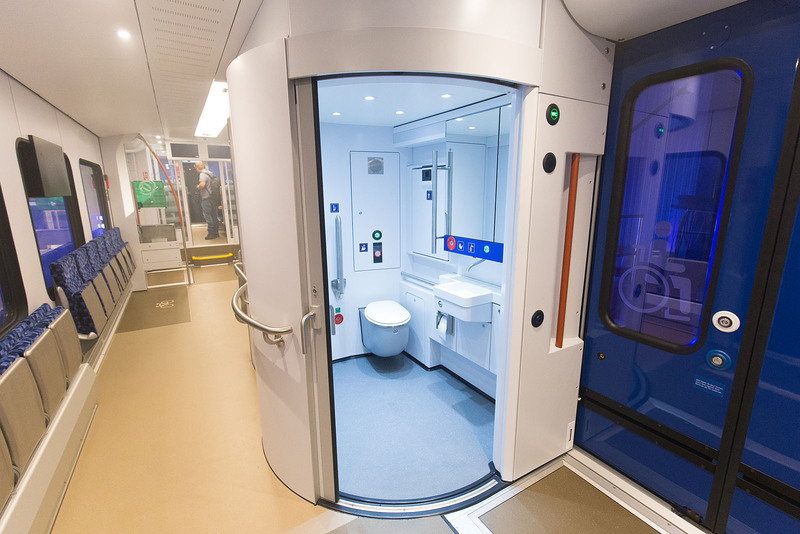 Finally, Abellio was the selected winner with its concept ‘DOOR’. However, soon ‘irregulaties’ were found in the bid of Abellio, and the winner was disqualified too. The Limburg province is now sueing Abellio.. This left Arriva a sole candidate for the contract. Limburg decided to award the company with the contract. Veolia objected, as they wanted a new tender, but finally decided to drop its appeal. Arriva got the contract in april 2016. 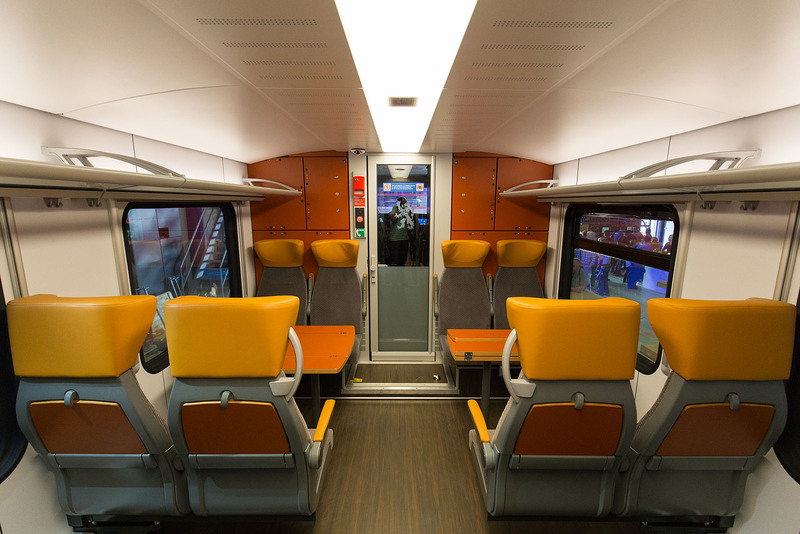 The first Arriva Nederland train is a 2-car set of the standard FLIRT3 design. Its livery resembles the artist impression Arriva published in 2015. The blue, white and yellow refer to the flag of Limburg. The light blue gradients from the impression did not make it to the final design. Same for the golden lines marking the entrance doors. The interior of the FLIRT3 is highly standardized, but within these standards it is very flexible. Arriva invited a select group of users from Limburg to give their final verdict on options such as floor covers, grip colors and the location of bike stalling. Also a lounge couch got added to the design. 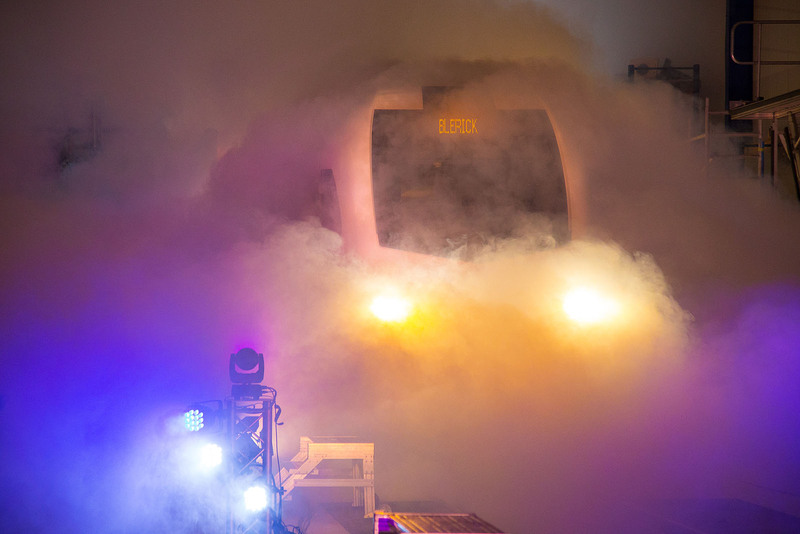 Arriva will get 36 new FLIRT3 trains in 2-car and 3-car configuration. Eight 3-car trains will be multi system trains than can run under both 1,5 (NL) and 3 kV DC (BE) catenary systems and 15 kV AC (DE) as well.